Orange County, California, which is sandwiched between Los Angeles and San Diego County, is probably best known as the home of beautiful beaches, pro sports teams, and several TV shows. As a lifelong resident, it’s easy to see how certain glamorous perceptions may be generalized for the whole county, but the full picture extends far beyond what can be seen on TV. To be honest, I grew up with a distorted view of the world spending my entire childhood in Irvine, noted by the FBI as the safest big city in the US, and is often referred to by locals as The Bubble. My view didn’t shift until I started volunteering at various schools, soup kitchens, and homeless shelters while attending college at Cal State Fullerton. During this time, I volunteered at multiple elementary schools within minutes of my college. Just a mile from my brand new state-of-the-art business college was an elementary school where students attended class in classrooms that lacked air conditioning and had dirt floors instead of carpeting. Most of the classrooms I volunteered in had just about every student enrolled in a free breakfast program, where students with low-income families stood in line for their morning allotment of fruits, vegetables, and milk (which was served in a plastic pouch and had to be poked through with a straw). This was not something that I grew up accustomed to, but it was clear it was routine here, with several kids voraciously consuming their food, as if they hadn’t eaten since the day before. These experiences were startlingly different than my own elementary school experiences. Being that I saw such vast differences in the handful of schools I visited, I wanted to look at some data to see how variable the elementary school experience is for all OC schools. For this report, I focused in on the percent of students eligible for free meal programs as my variable, given that a student’s eligibility is determined by their family’s household income in relation to the poverty line. Among the 58 California counties, Orange County public school students had the 18th lowest proportion eligible for free meals (still at 39.9%). 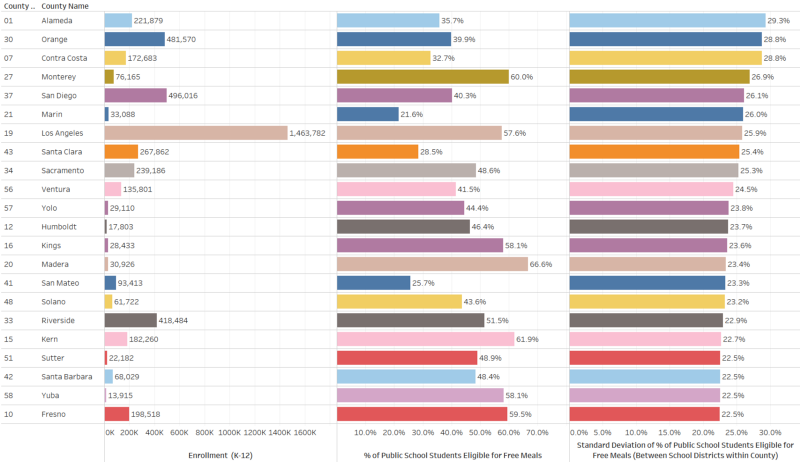 While Orange County public schools have a lower-than-average percentage of students eligible for free meals, there is a high standard deviation among the school districts in the OC (see below). 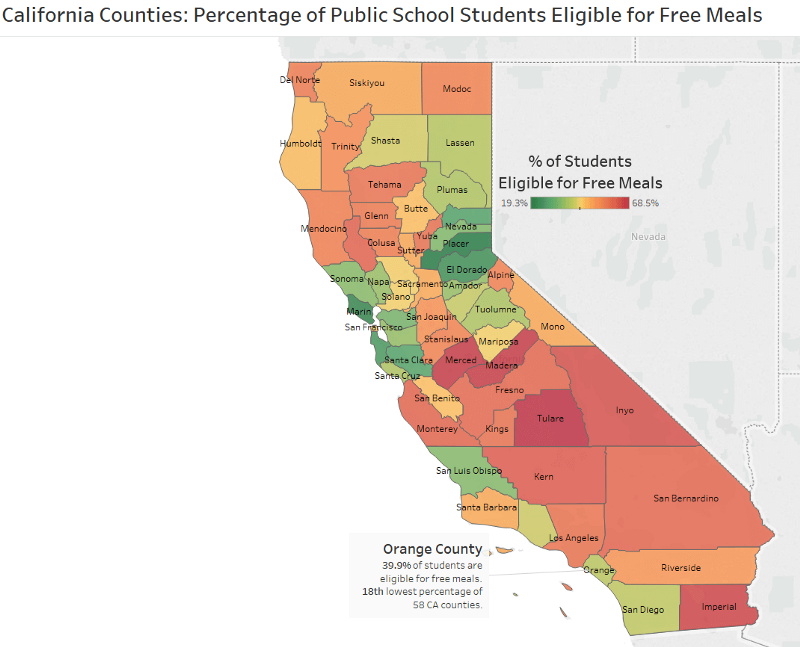 When looking at each CA county’s standard deviation with regards to variability between free meal program eligibility rates among each counties’ individual schools, the variability in Orange County is immediately apparent. Orange County has a standard deviation of 28.8%, which is the second highest standard deviation among all California counties. With regards to standard deviation, Orange County is sandwiched between Alameda County and Contra Costa County, which are both neighboring counties just north of Silicon Valley. Taking a look at the plots above, where triangles represent each individual public-school district in each county, you can see a noticeable gap for Orange County between the median line (the black line in-between the two blue-shaded boxes, and the 75th-percentile marker (which is represented by the black line on the right of the light blue box). When you look at the other populous districts like LA and San Diego, there’s a relatively even distribution of schools throughout the range, unlike Orange County. For Orange County districts, it’s almost like there’s an imaginary boundary between school districts with high and low dependence on free meals. Of OC’s largest districts, Santa Ana holds an overwhelmingly high ratio with 80.3% of students eligible for free meals. On the other hand, my hometown, Irvine, can be seen on the bottom right with an exceptionally low rate of 10.3%. This graph shows that even the wealthiest districts have schools that are highly dependent on free and reduced meal programs. 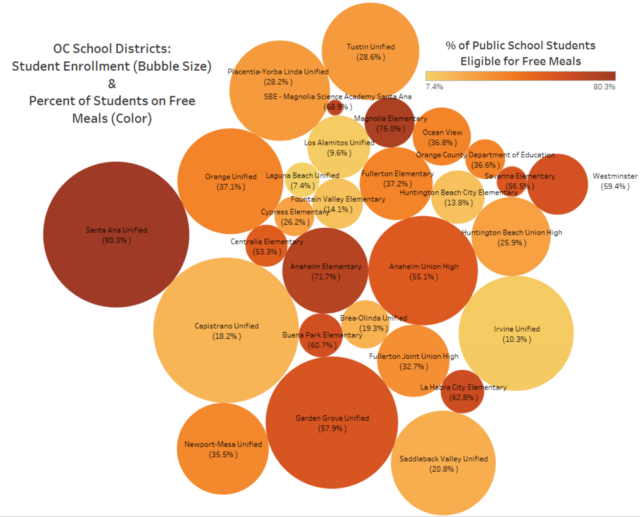 Looking at the dots in the above chart, which represent the school with the highest proportion of students eligible for free meals in each OC school district, you’ll see that Santa Ana Unified is the school district with the public school with the highest proportion on free meal programs (95.8%). Yet, the district with the next highest maximum is Placentia-Yorba Linda Unified (89.4%) and Capistrano Unified (87.9%) closely follows in fourth. 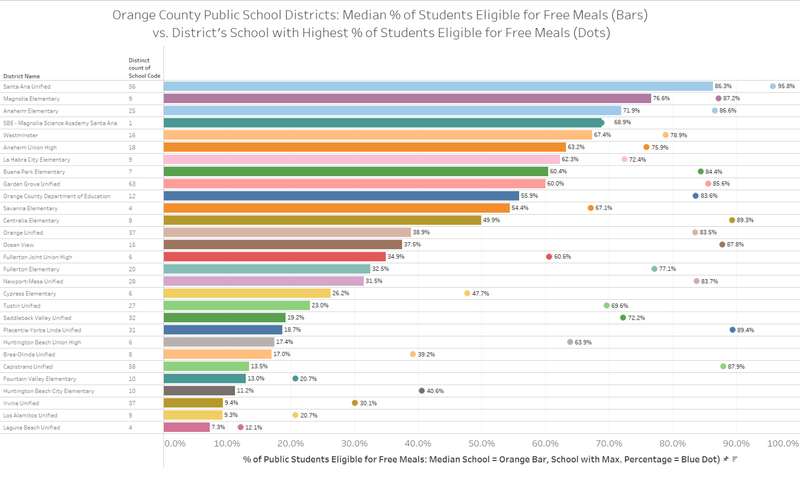 Placentia-Yorba Linda and Capistrano have some of the schools most dependent on free meal programs, despite the overall districts having the 9th and 6th lowest median proportion of students eligible, respectively. Both are relatively wealthy areas, and Yorba Linda has a median household income of $117,855 and a recent study pegged it as the 6th wealthiest city in the nation, yet it still has a school with one of the highest dependence on free meal programs. This problem isn’t decreasing, either, when looking at each OC school district, there’s been plenty of increases in free meals since just 2012. 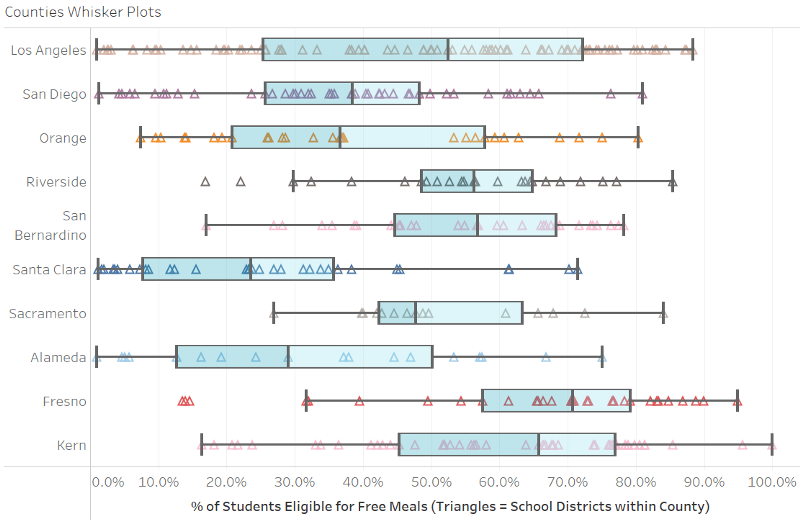 As you can see above, plenty of OC school districts saw an increase in students eligible for free meals, with some districts seeing over 75% of their schools registering an increase in free meal eligibility. My main takeaway after researching and writing this article is that even in some of the most glamorous-looking areas, there’s many in need. No area can ever be overlooked. This is my first data article on food instability and poverty, but I plan to write much more. If you would have any comments, additional data sets, or would like to collaborate, please don’t hesitate to contact me. Here’s a list of top charities that fight hunger (I currently volunteer with Feeding America through Second Harvest Food Bank Orange County).